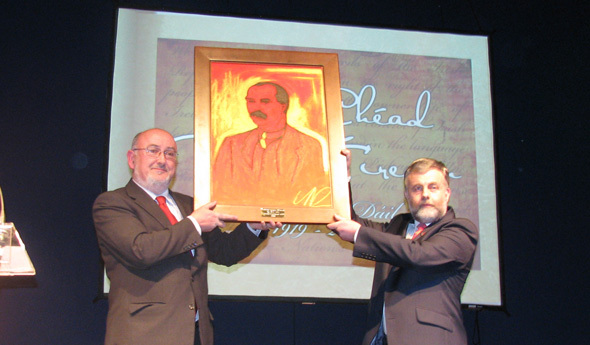 During this evening’s Sinn Féin An Chéad Dáil Éireann 90th anniversary commemorations held in the historic Round Room in the Mansion House Sinn Féin Dáil Leader Caoimhghín Ó Caoláin TD made a presentation to Jack O’Connor, President of SIPTU, marking the centenary this month of the Irish Transport and General Workers Union. “Cuireann sé áthas orm mar Ceannaire Dála Shinn Féin fáilte a chur romhaibh chun an ócáid speisialta seo. It is an honour to welcome you all to this historic and momentous event tonight on my own behalf and on behalf of our TDs and Senator. We are very proud to play our part, with Sinn Féin elected representatives in all elected fora, in carrying forward and completing the work of An Chéad Dáil Éireann. 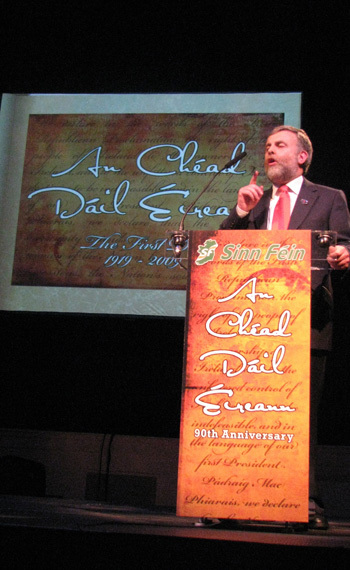 “The organised workers of Ireland played a central role in all the events leading to the establishment of the First Dáil. It is appropriate therefore that this month also marks the centenary of the union that organised those workers at the start of the last century, the Irish Transport and General Workers Union which was founded 100 years ago in January 1909. “The ITGWU for the first time organised the unorganised, the lowest paid and the most harshly treated workers in Ireland. Jim Larkin lit a fire that blazed in 1913 and forged in the struggle of the Great Lockout a trade union movement that grew from strength to strength. James Connolly led the vanguard of that movement in the Irish Citizen Army without which there would have been no Rising in 1916. Organised labour defeated Conscription in the General Strike of 1918. The ideals of Connolly were enshrined in the Democratic Programme adopted by the First Dáil here 90 years ago. “Ever since then the most progressive sections of the republican and trade union movements have always acted on James Connolly’s words that the cause of Ireland is the cause of labour and the cause of labour is the cause of Ireland, they cannot be separated. “Today organised workers face equally daunting struggles. An effort is being made by some to scapegoat workers in the public sector for the economic recession. Attempts are being made to further drive down pay and conditions in the private sector. The spectre of the lengthening dole queue is with us again. Never was there a greater need for the left in Irish politics to join with the trade union movement and with the vast majority of people in calling to account the greed-driven William Martin Murphy’s of our time who have created this economic disaster. 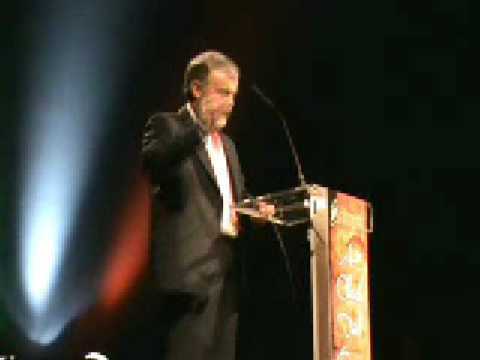 “In that spirit of unity I ask you to welcome our special guest, the General Secretary of SIPTU, Jack O’Connor.